For company profiles, 2015 has been considered as the base year for calculating market share and the competitive landscape. Where information is unavailable for the base year, the prior year has been considered. 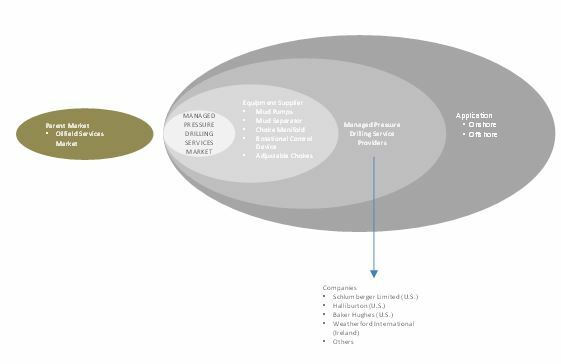 The market ecosystem of managed pressure drilling services includes raw material suppliers, comprising electronic/electrical components, metals, and sensors among others. In the later stage, manufacturing of managed pressure drilling services takes place where all raw materials are assembled. These devices are then distributed to distribution utilities, industries, and T&D companies. “Study answers several questions for the stakeholders, primarily which market segments to focus on in the next 2–5 years for prioritizing efforts and investments”. 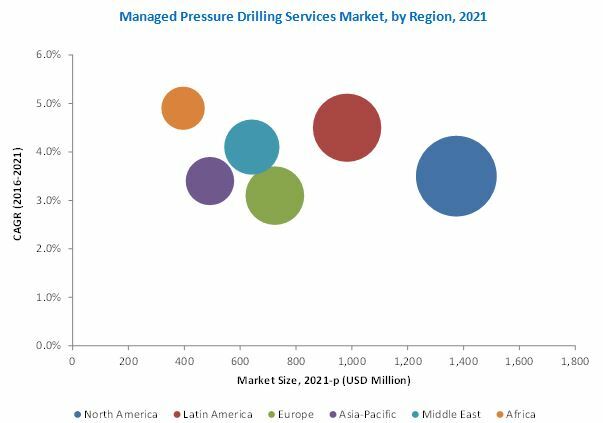 The global managed pressure drilling services market is projected to witness high growth on account of growing need for optimized drilling processes and safe & effective operational aspects of managed pressure drilling. The global market is estimated to be USD 3.81 Billion in 2016, and is projected to reach USD 4.60 Billion by 2021, at a CAGR of 3.8% from 2016 to 2021. Deepwater drilling in Africa and Latin America is expected to boost the demand for managed pressure drilling services during the forecast period. The North American market is also projected to grow at a moderate pace, aided by large-scale spending for the development of unconventional resources, such as shale plays, where managed pressure drilling is used to access difficult formation and drill wells in the most economical way. Among various technologies of managed pressure drilling services, the Constant Bottom Hole Pressure (CBHP) segment is expected to have the largest market share during the forecast period; it is also expected to grow at the highest CAGR during the same period. This growth is attributed to extensive utilization of the technology for drilling offshore wells across the U.S. Gulf of Mexico as well as in other regions of the world. The market for Dual Gradient Drilling (DGD) technology is also projected to grow at a fast pace, owing to its utility in mitigating formation damage in deepwater drilling. In terms of application, the offshore segment held the largest share in the managed pressure drilling services market in 2015; this segment is expected to continue its dominance in the market during the forecast period. This can be attributed to the frequent use of managed pressure drilling in High Pressure High Temperature (HPHT) wells and deepwater resources. This segment is expected to account for nearly two-third of the total market in 2016. North America is expected to dominate the market throughout the forecast period, due to technological capabilities and the ability to invest huge capital. There has been a 15% increase in U.S. crude oil production levels between 2013 and 2014. The U.S. accounts for a major portion of the drilling activities in the region. On the other hand, the African market is likely to have the fastest growth during the forecast period as increased production in West Africa is expected to counter the production decline from the North African region. Managed pressure drilling services are used to maintain accurate control of wellbore pressure. The sudden downturn in crude oil prices since July, 2014 has negatively impacted the oil & gas industry, leading to a reduction in capital expenditure and cancelled contracts. Leading players in the market such as Weatherford International (U.S.), Schlumberger (U.S.), Baker Hughes (U.S.), Halliburton (U.S.), and Aker Solutions (Norway) have used different strategies to gain market share and cope with difficult market conditions. The recent consolidation in the industry led by the proposed Halliburton-Baker merger is expected to alter the competitive dynamics of the market in favor of large organizations. All the leading players in the managed pressure drilling services market have been profiled in the report with detailed analyses of their strategies, strengths, weaknesses, opportunities, and threats. 10.9 Ensign Energy Services Inc.
10.11 Strata Energy Services Inc. Figure 45 SWOT Analysis: Baker Hughes Inc.